Sometimes we get a new product in that is so universally adored by the entire staff of Purl Soho that we know we need to make a Purl Bee project out of it. 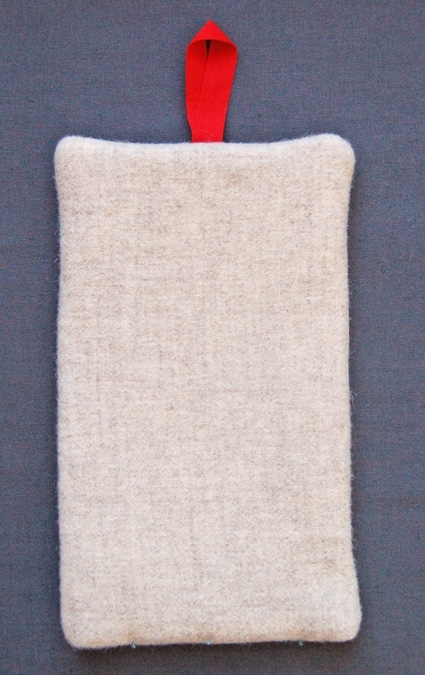 Our latest obsession is the new natural colorway of the Mary Flanagan Felted Wool called “Oatmeal”. 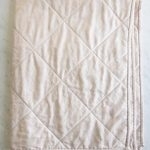 It soft and fluffy and ever so slightly heathered in gorgeous natural ecru and brown shades. Every time I pass by it’s shelf in the store I want to pull it out and touch it. 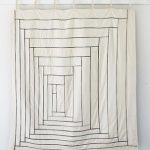 I have always loved Mary Flanagan’s whole spectrum of 13-inch by 16-inch pieces of felted wool. They are so fluffy and soft. 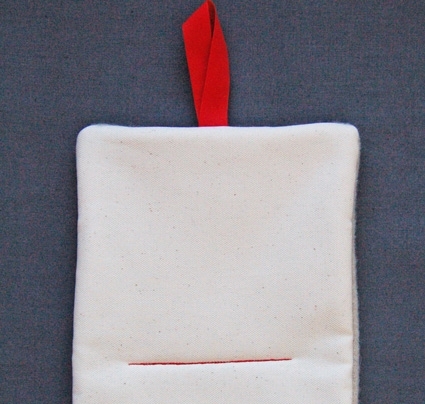 I’ve sewn it into all kinds of things, from baby dolls, to blankets, to mittens. This time I wanted to make something you could use, see, and touch every day. 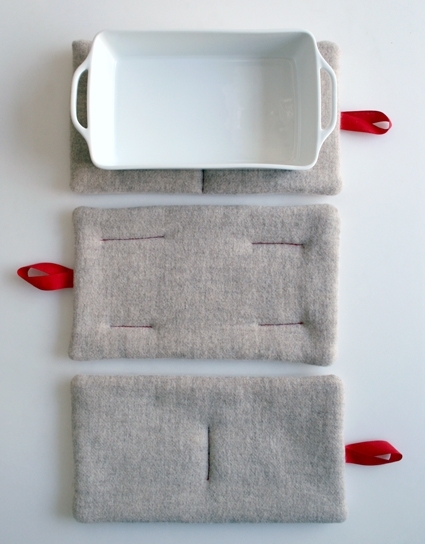 Page, Joelle, and I all brainstormed and come up with these fluffy hot pads, which are so easy to make! 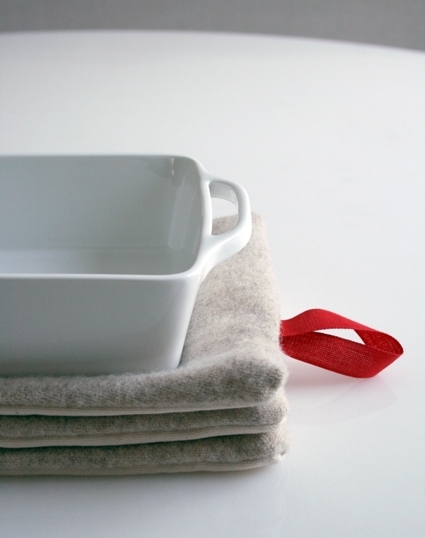 In order to make one piece of precious felt into two hot pads we used Carr Textiles Organic Cotton Duck as a backing. 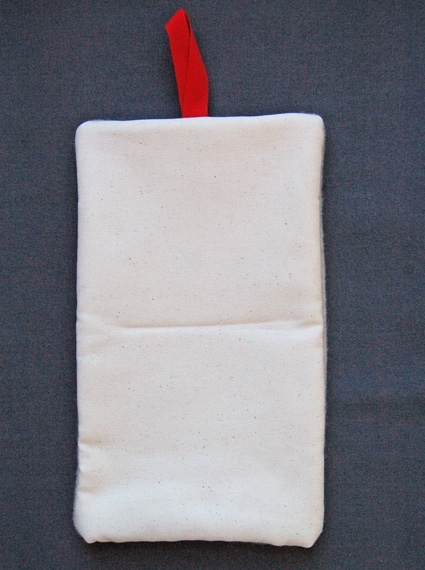 This canvas weight fabric is so sturdy and comes in great colors. The natural color that we used is smooth and slightly flecked which compliments and contrasts with the wool nicely. 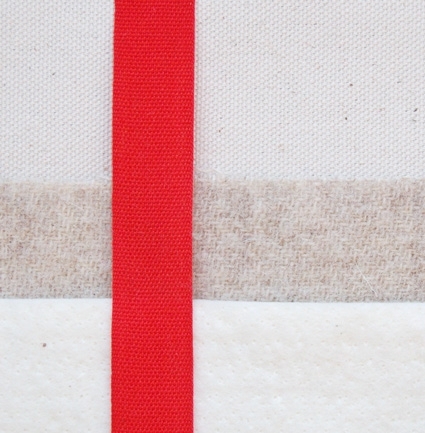 To add a kitchen-y feel we accented them with bright red Fettucia Cotton Ribbon and did some simple quilting with bright red cotton thread. They are sewn with two layers of our thickest cotton batting making them very heat resistant and super lofty. Their rectangular shape makes them ideal for grabbing hot dishes out of the oven and holding onto pan handles. They are also pretty enough to use as trivets directly on the table. 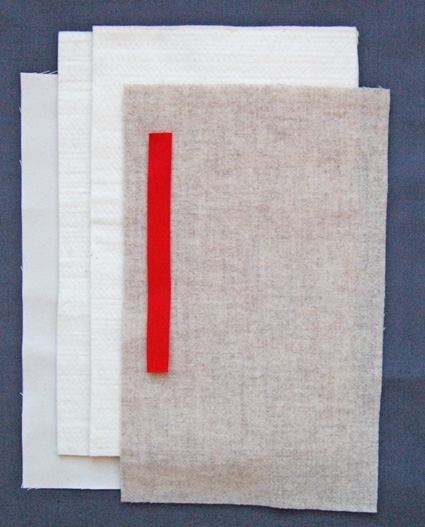 Cut the wool felt into two 8-inch X 13-inch pieces. 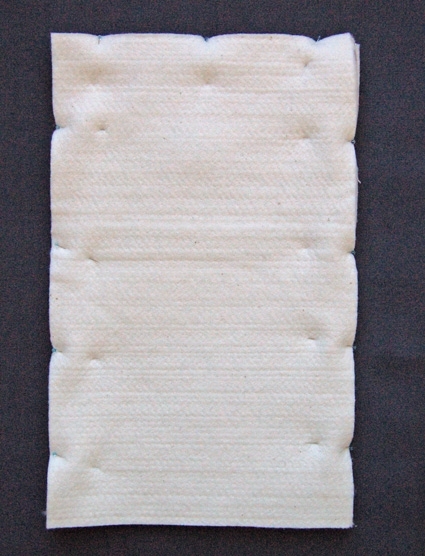 Cut the cotton duck into two 8-inch X 13-inch pieces. Cut the batting into four 8-inch X 13-inch pieces. Cut two 7-inch lengths of the ribbon. 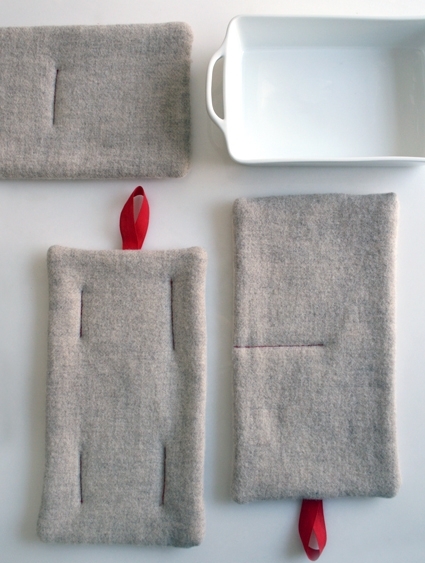 You will use 1 wool felt piece, one cotton duck piece, two pieces of batting, and one length of ribbon per hot pad. Lay one piece of batting down and smooth it flat. 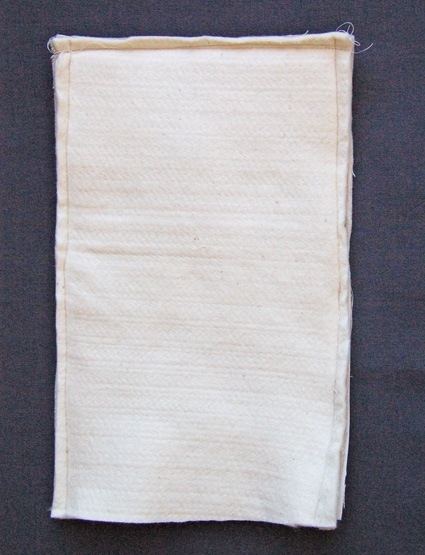 Lay a piece of cotton duck on top of the batting and then place the doubled length of ribbon in the middle of the top short side of the piece as shown above. Lay the wool felt on top of the batting, duck, and ribbon, making sure to keep the ribbon in place. Then place the second piece of batting on top of all the other layers. 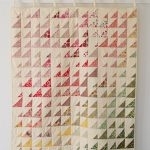 Your quilt “sandwich” should now be in the following order: batting, duck, ribbon, felt, batting. Pin through all of the layers along three sides, leaving the short side that does not contain the ribbon un-pinned. Using your machine’s walking foot and the ecru thread sew the layers together with a 1/2-inch seam allowance along the three pinned sides, leaving the un-pinned side open. Turn the piece right side out. The ribbon should poke out at the top like so. 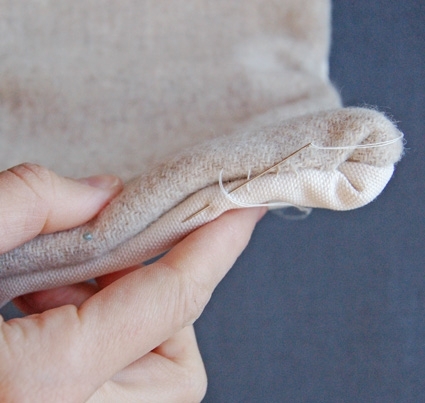 Tuck the raw edges of the un-sewn side 1/2-inch into themselves and pin the opening closed. Hand sew the open edge closed with a blind stitch using the ecru thread. Mark the area or areas that you would like to quilt. I used a Hera Marker to make a small crease across the middle of the hot pad. 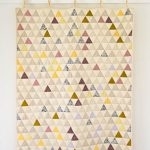 You can add as many quilted lines as you like or as few as one in the middle, as I did in the example. 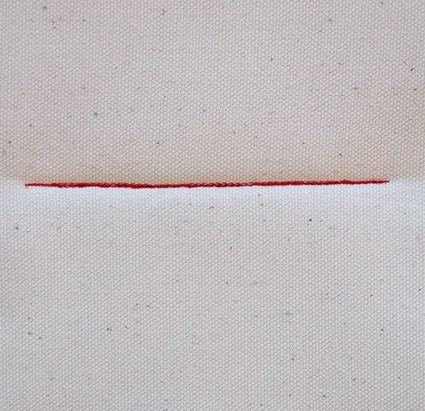 Using the red thread and your machine’s walking foot, quilt along the mark (or markings as the case may be). 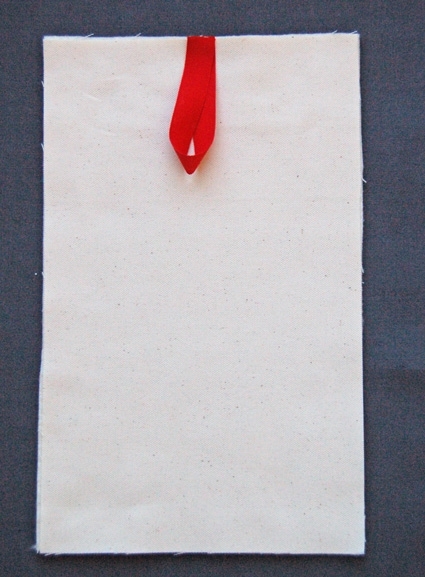 Go forwards and backwards along the quilted line(s) to make a bold red line as shown above. Repeat for the second hot pad and you’re all done! I like these and the fact they could be customised in such a variety of ways. these are super awesome. Thank for the tutorial. Way cooler than storebought! Can this trivet be machine washed? These should be hand washed. this may be a stupid question but why do they have to be hand washed? It's not a stupid question at all! They should be hand washed because the felt is 100% wool and can shrink in unexpected ways if you machine wash it. You could machine wash and dry the felt and the cotton fabric before sewing them if you wanted to be able to machine wash them later. But the felt might get a little misshapen in the wash, it might look really cute though.